As a dedication to the community’s tragic July 2015 movie theater shooting in Lafayette, students and faculty from the UL-Lafayette School of Architecture and Design collaborated with the Social Sciences and Humanities Research Council of Canada, Acadiana Center for the Arts, Lafayette Consolidated Government, Lafayette Public Trust Financing Authority and eight other universities (including Delhousie University in Nova Scotia) to create the new Lafayette Strong Pavilion, located at 400 Camellia Blvd. 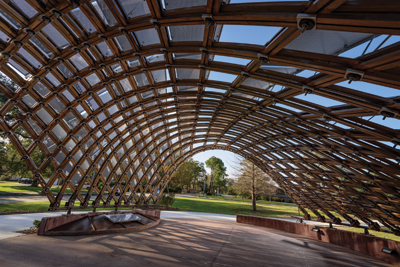 Also known as the Camellia Gridshell Pavilion, the open-air dome-shaped $77,000 structure, spearheaded by Professor Geoff Gjertson, was ceremoniously unveiled in January. It’s the first installment among five gridshells underway; a fifth will be built in Nova Scotia this summer. Fifty artworks for the new Camellia Art Sculpture Park are also in the works. 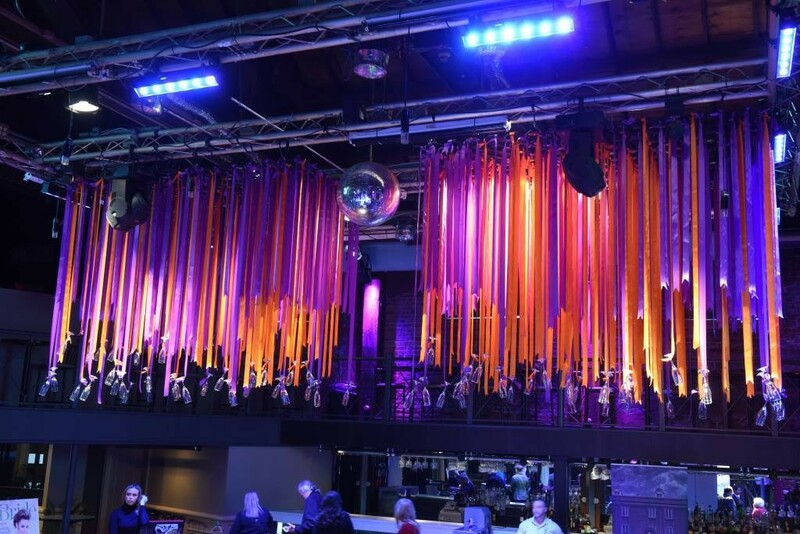 The first art installment, titled “Endless Angels,” is an ethereal 15-foot-tall bronze sculpture depicting four ascending figures with connected wings. It was created by internationally acclaimed sculptor Russell Whiting, known for pioneering the art of carving steel with the oxy-acetylene torch that produces complex, heavily textured surfaces. Upon touring Whiting’s other commissions at his art-filled home near Henderson, we viewed a towering 6,000-lb. steel sculpture of a life-like buffalo, which was en route to the corporate headquarters of philanthropist William “Bill” Goldring, Chairman of the Sazerac Co., the largest distilling company in the U.S. “He also owns Buffalo Trace Bourbon and has other buffalo-inspired artworks in his extensive collection,” explains Whiting. A $20 million investment is slated for the tiny town of Charenton in St. Mary Parish as the Chitimacha Indian Tribe renovates and expands its Cypress Bayou Casino Hotel. Added gaming including a new high-limit area for gamblers, a new restaurant (Café Delphines), new retail operations and an expanded pool area with a pool bar, lazy river and pool-side cabanas are underway (cypressbayou.com). After weeks of tallying votes, USA Today readers named their top overall favorite food factory nationwide. The Tabasco Pepper Sauce Factory Tour at Avery Island ranked among the top 10 (Tabasco.com). If you’re visiting New Iberia April 8-10, keep a lookout for Detective Dave Robicheaux look-alikes during the first annual eponymous fest in honor of that complex Cajun sleuth created by local author James Lee Burke. Held in the city’s historic district, the inaugural Dave Robicheaux Hometown Literary Festival kicks off Friday night with a bayou jam session, and a cochon du lait featuring live music at Shadows-on-the-Teche. This is where you may come across a multitude of Dave Robicheaux posers during the Look-Alike Contest. Academic panel discussions, actors performing vignettes of Burke novels and one-act plays, live music and local food at Bouligny Plaza, local storytellers, bouree lessons, showings of “In the Electric Mist” with Tommy Lee Jones (who stayed in New Iberia during the filming) and a Saturday night fais-do-do will get fans dancing in the streets. Visit IberiaTravel.com/Dave-Robicheaux-Literary-Festival. Photographer John Slaughter’s new book, Catahoula: Louisiana State Dog (Paperback; November 2015; UL at Lafayette Press), is filled with intriguing color photos of the compelling breed with human-like eyes. The owners’ stories explain their widespread appeal. Slaughter opened Catahoula’s restaurant in his home town of Grand Coteau in 1996, and filled it with large photos of Cataholas including his own dog, which he dubbed “a very old soul.” Foodies listen up: Grand Coteau Bistro has replaced Catahoula’s; it opened in late fall, 2015 and is well worth visiting, co-owned by former “Chopped” champion, Chef Christopher Thames (Tip: Try the seared salmon with roasted beets for dinner or the French toast stuffed with pungent goat cheese and sweet thyme honey for brunch).